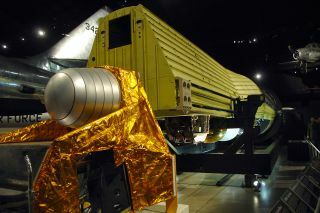 Hexagon KH-9 is one of three formerly classified reconnaissance satellites that went on display at the National Museum of the U.S. Air Force in Dayton, Ohio, starting Jan. 26, 2012. It’s been super-secret for so many years, but for one day only on Saturday (Sept. 17), some of the United States' once-clandestine spy satellites will be seen by public eyes for the first time. The buzz in space security circles is that the National Reconnaissance Office (NRO) will apparently lift the veil of silence on its hush-hush early spysat hardware — space-based James Bondish satellites that performed highly classified, intelligence-gathering duties. The odds are that NRO's GAMBIT and HEXAGON space surveillance programs of the 1960s will be the spotlighted projects. A HEXAGON satellite will be on display Saturday at the Smithsonian Institution's National Air and Space Museum's Steven F. Udvar Hazy Center, in Chantilly, Va.
At 60 feet (18 meters) long and 10 feet (3 m) wide, the HEXAGON satellites were the largest spy satellites the United States ever launched into space. The satellites took photographs of the Soviet Union and other targets around the world from 1971 to the early 1980s, according to a Smithsonian announcement. Reportedly, the event will be a packed house of government civilian, military, and industry attendees. The commemoration is co-hosted by the NRO, the Smithsonian and the American Institute of Aeronautics and Astronautics (AIAA). "The commemorative event is being held to recognize and celebrate the collective contributions that the NRO's people and innovative technologies have made to our nation’s security in supporting policy decisions, intelligence activities, and military operations around the world," an AIAA announcement stated. "As part of this event, the NRO plans to highlight examples of those contributions by unveiling two legacy satellite reconnaissance systems." The artifacts being unveiled will be on display during the gala. National Reconnaissance Office Director Bruce Carlson and cake design winner, Alli Taylor, cutting the official NRO birthday cake to mark the 50th anniversary of the U.S. space surveillance agency..
For its part, the NRO clearly has a secret legacy to stand on. "When the United States needs eyes and ears in critical places where no human can reach — be it over the most rugged terrain or through the most hostile territory — it turns to the National Reconnaissance Office," reads a statement on the NRO website. The NRO is the U.S. government agency in charge of designing, building, launching and maintaining America's vital intelligence satellites. From its inception as a hush-hush entity in 1960s to their out-in-the-open declassification in 1992, NRO is geared to crank out reconnaissance support to the intelligence community and Department of Defense. In the Sept. 12 edition of "The Space Review," noted military space historian Dwayne Day pointed out in an article entitled "Flashlights in the Dark" that the decades-long secrecy over two of NRO's Cold War era satellite programs — the Keyhole-7 GAMBIT and Keyhole-9 HEXAGON — is being cast off. "GAMBIT was started in 1960, with a first launch in 1963. HEXAGON started in 1966, with a first launch in 1971. Both programs operated until the mid-1980s. Both used cameras that recorded their images on film that was parachuted to Earth," Day explained in his article. "Both were highly successful. And both represented the pinnacle of American Cold War intelligence collection technology, unmatched in capabilities by any other nation." "That review started in the latter 1990s, but then got put on hold. Probably the reason that these programs are finally being declassified is mostly because the National Reconnaissance Office is celebrating its fiftieth anniversary … and also because the Obama administration is more open to some declassification of historical programs, more so than the Bush administration," Day said. Day explained that what people don't realize is that while NASA was doing amazing things in space in the 1960s and later, there was a whole other military space program that was also accomplishing amazing things. "The NRO was operating intelligence satellites that were astounding in their capabilities. These satellites helped reveal what the Soviet Union was doing so that they could not surprise us. And they also made it possible to verify the arms control treaties that the superpowers signed in the early 1970s," Day said. Bruce Carlson was appointed as the 17th Director of the NRO in June 2009. Speaking last month before a gathering of small satellite developers at Utah State University, he noted that the CORONA program was developed as a work-around to an image transmission problem and provided a vital capability. First satellite reconnaissance program to pass the 100-mission mark — 145 satellites were launched under the CORONA program. "This year marks the 50th Anniversary of the NRO. During that time, our mission has transitioned from a mission focused on the USSR to a diverse and widely dispersed mission which includes international terrorists, drug traffickers, peacekeeping and humanitarian relief operations … to name a few," Carlson said. The National Reconnaissance Office's 50th Anniversary cake and commemorative poster to mark the Sept. 9 founding of the U.S. spy satellite agency. According to Jeffrey Richelson, a senior fellow of the National Security Archive who has written extensively about the NRO and space reconnaissance, NRO throwing light on deep secrets is refreshing news. “Gambit and Hexagon declassification is the logical next step if the NRO was going to do anything really significant for the 50th anniversary,” Richelson told SPACE.com. Hexagon declassification was envisioned in President Bill Clinton’s 1995 executive order. There was the 2002 declassification of Keyhole-7 and Keyhole-9 (known in short hand as KH) mapping product. "This may largely complete the process — or at least begin to complete the process — of declassifying the G and H programs — if KH-8 data and product is declassified along with KH-7. But even if it is G/KH-7 and H, it would be significant,” Richelson said. “Certainly the declassification has the potential for providing a lot of new historical data about the satellite imagery effort."